Stuck without a fireplace this holiday season? No problem. Just crack open your laptop (or even your smartphone or iPad), fire up YouTube, and warm up with one of these cozy digital Yule logs. Read on for five of my favorites, from the original WPIX Yule log to one with its own audio commentary. What you’ll hear: A spot-on parody of those self-serious commentary tracks you hear too often on DVDs. Overall: The video quality isn’t amazing, but I love the Santa’s cap and guitar that flank the warm fireplace—and nice-looking logs, by the way. 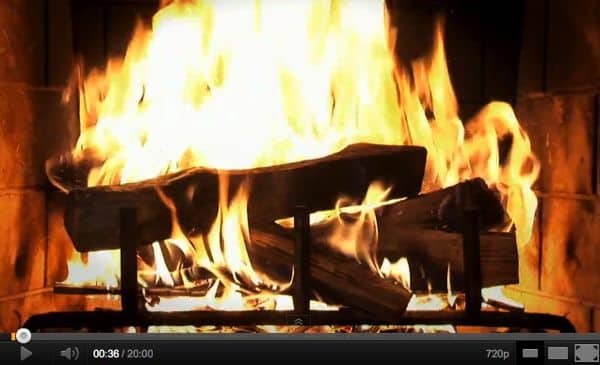 Overall: Short, and iffy video quality, but c’mon—this is the original yule log video. A piece of television history, no doubt. Happy holidays, everyone—and if you have a favorite YouTube Yule log, post it below!